Lighting-Gallery-net - circline and u-bent fluorescent tubes/H&H Vit-Tek 93 circline rare! 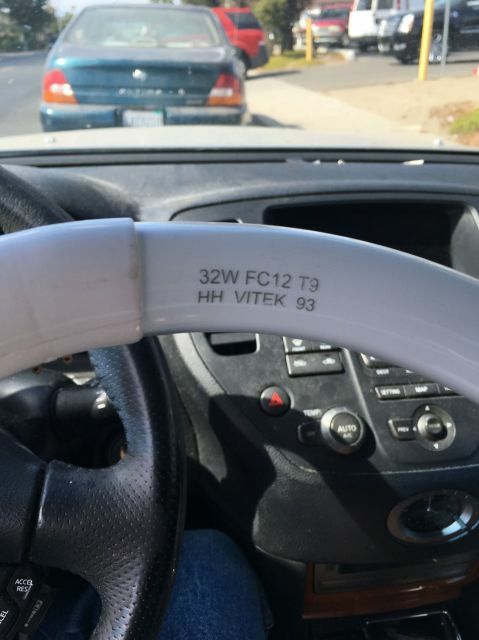 H&H Vit-Tek 93 circline rare! Never thought I'd find a H&H circline! Good quality full spectrum light. So is this similar to stuff like Duro-Test "Vita-Lite" in color when lit? Yes. They are the good stuff. I have German-made brass based (!) 17 watt 2' T-8 Vi-Tek 93's in my my music room, one in a F20 preheat unit, 2 on an electronic T-8 ballast. They are actually about 6700 K. Slightly bluer than daylight lamps. The color rendering and visual contrast are the best I have ever seen! Show my an LED that can do this and I will EAT it with the power applied! This circline looks to be a rather generic China-Junk made one though. i never thought V-Tek would stoop that low. I have a pair of Chinese circlines, 32 and 40 watt, in 3500 K--rare as well! You asked, you got it. Here's a Soora CRI 95 LED. What does "BLH is a myth" mean??? blue light hazard is a myth. That was fast! I just put that in earlier today! Did you do homework to prove it? Easy. Use LEDs before bedtime. Sleep pattern doesn't change from using LEDs from sleep patterns from using incandescent before bedtime. The only time I lost sleep is due to a cycling HPS acorn post top at the old house. And college exam worries. Fixing cars are fun but exams aren't. Most of these "tests" with my sleep patterns are done at home so I technically did my homework! Ok I dare you to try a bright blue LED filament. 5w 120v and all. Don't have that blue filament LED. Or Solanaceae's brainwave machine. Go on eBay or Craigslist. Maybe a hospital machine will pop up at an abandoned asylum of sorts.